The Top Fuel class is regarded as the Kings of the Sport for obvious reasons. If Nitromethane burning Hemi’s putting power to the ground through a 300” long chassis that shoots rooster tails 20’ in the air off of the Skat-Trak Hookers or Bigger Diggers and accelerates from 0-160mph in 2.2 seconds does nothing for you, then you obviously aren’t alive. This class once again thrilled crowds in 2010 with record breaking times & competition. 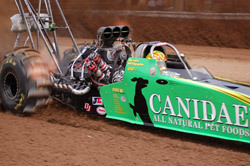 Let’s take a look at the Best Runs of Top Fuel in 2010. 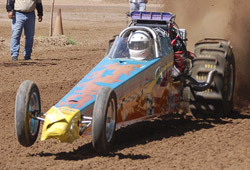 The Top Alcohol class has been a staple of sand drag racing for many years now. This competitive class is no limitation in rules, with the exception being that Methanol is the only fuel allowed. Over the years, this class has progressed into a high tech realm not imaginable beforehand. These entries are becoming closer to their asphalt counterparts, along with major influences in knowledge from that side of the drag racing world. The economy has taken its toll on the racer count, but there is still exceptional competition in this category. The data used is from events that we attended or the info was submitted to us. Let’s take a look at the 2010 Best Runs in Top Alcohol. 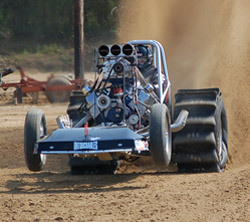 In all of sand drag racing, some of the most exciting and unique vehicles are the wild Turbo 4-cylinder powered Dragsters. We will categorize this group of vehicles as A/Fuel. These cars either run in their own class, or in the Top Eliminator & Super Eliminator Index categories depending on the event. There still is a lot of interest and various different pockets across the country where this type of car is popular. For this Best Runs compilation, all 4-cylinder runs, whether they were in Super Eliminator, Top Eliminator, or A/Fuel to come up with the best runs in this classification. Let’s take a look at the Top 10 Best Runs. The Midwest-based Pro Truck Nationals series introduced a new class in 2010. 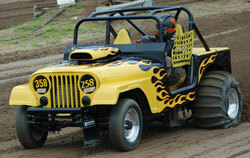 This class supplanted the Fastest 4x4 class, which was a heads-up class limited to 4WD vehicles. The new category, Pro Outlaw FE is heads-up and open to both 2 & 4 wheel drive vehicles, but is strictly for Front Engine entries with a wheel base less than 150”. This has turned into a wildly popular class in this area with entertaining wheels up action. Let’s take a look at the Best Runs in the PTN Pro Outlaw FE class in 2010. The 2010 race season is now in the books. It was definitely a banner year for NSDN. We were able to present 14 Daily Race Coverages from 10 different venues in 6 states. I definitely logged a lot of miles, but it was completely worth it. Seeing new parts of the country, interacting with the best people on earth (racers/track staff/spectators), and experiencing first hand the best sand drag racing in the world is just the best. I can’t begin to describe how lucky I am to be able to do this each season. Let me take this time to thank those that helped make this happen as well as reflect on the season that was. In 2010, NSDA introduced a new class called Super Eliminator with an Index of 2.80. Seeing a need for a class in between Top Alcohol & Top Eliminator, this category’s goal was to fill that gap in between. Obviously a new class will have growing pains, but despite that the competition was intense at each event it was contested. 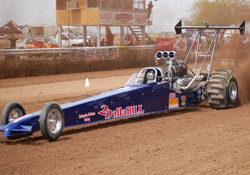 Blown Alcohol Dragsters and Turbo 4-cylinder Dragsters duked it out in intense Index-style racing. Let’s take a look at the Best Runs in this category in 2010. Announced today is a new sponsorship for the upcoming 2nd Annual AZ vs. CA Top Fuel Showdown at Dome Valley Raceway in Wellton, AZ on January 22-23. The popular Midwest Pro Outlaw FE class will be run for the first time on the west coast at this event. This class has picked up co-class sponsors as Pro Truck Nationals and Richard's Auto Parts have come on board with added purse money for this event. Over $800 will go to first place with an eight car field, and the purse increases proportionally with entry count in the class. The Pro Truck Nationals series is excited to see this class being adopted in other areas of the country, and is glad to be on board with this great event. Richard's Auto Parts, run by PTN manager Rich Simon, offers a full line of performance & standard automotive parts. Both of these sponsors can be found online, at www.protrucknationals.net & www.richardsautoparts.com. Also, other sponsorships are available for this event by calling Mike Erwin at 928-941-0335 or Charlie Lowe at 623-340-8209. Another note on this event is that the Pro Sport class has been renamed to Open Pro. For the next few weeks, NSDN is going to feature the best runs of 2010. Since we have the data from most major events from this season, we have compiled the quickest ET’s from Top Fuel, Top Alcohol, A/Fuel, and Pro Outlaw FE as well as closest to the Index runs in Super Eliminator & Top Eliminator. The data used is from events that we attended or the info was submitted to us. One class will be posted per week with some commentary & recognition for winners in those classes throughout 2010. Let’s dive right into our first class. 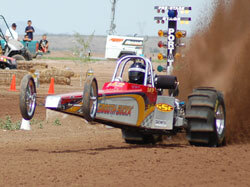 Top Eliminator has become one of the toughest categories in the whole sport of sand drag racing. A diverse grouping of cars show up at races all across the country shooting to run as close to the 2.95 Index as possible. You see everything from Blown Big Block V8 to Carbureted Nitrous-assisted V8 to Turbo 4-cylinder on Nitro and everything in between for power plants with Dragsters, Altered, Jeeps, Buggies, etc. used for chassis. This class is all about utilizing the combination to cut a great Reaction Time and run as close to 2.95 as possible. Let’s take a look at the top runs of 2010. A huge racer turnout made the trip to Kingman, AZ’s Mohave County Fairgrounds for the West Coast Winternationals Sand Drags presented by Route 66 Wings & Wheels. With the huge turnout, there was a ton of great racing on track. Let’s take a look at the happenings from this event.